On The Mccloud is a painting by Janet Biondi which was uploaded on November 5th, 2015. 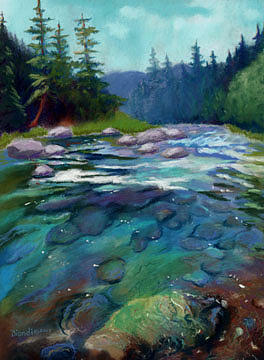 This is a sister painting to McCloud River Sunset. I lived on the McCloud river for 6 years at the Bollibokka Flyfishing Club as a caretaker. It's a pristine environment with Mountain lions, eagles, bear and other wildlife and the river is a world-class flyfishing river! There are no comments for On The Mccloud. Click here to post the first comment.